﻿Hello all and welcome! Welcome to this amazing family we call the Mighty Black & Gold Band. We are so excited to have you apart of us. You are about to embark on an incredible journey over the next four years of you life. Through this adventure, you will learn several invaluable life lessons and as we all strive to maintain our standards of Family, Pride, Tradition, and Excellence. By landing on this page, you have taken the first step toward membership in this family. Here, you will find most answers to questions you may have about our organization. If you still have questions after reading through this, please don't hesitate to call us at (850)983-5611 or CLICK HERE and fill out the contact form. Together We Are THE MIGHTY BLACK & GOLD! I highly encourage you to download and read through the GENERAL INFORMATION ABOUT THE MHS BAND button below. There is very detailed information further explaining finances, parent involvement, school-owned instruments, alternate line, and many many more. Does it cost to be in band? Unfortunately the answer is “yes”. Our school district is unable to finance many of the expenses that we incur. The “Fair Share” for the upcoming school year is estimated to be around $225-$300. $75 of this may be worked off by having a parent volunteer at three fundraising events sponsored by the MHS Band Parent Association…lowering your fair share by $75 for the year. Students will have plenty of opportunities to fund-raise their fees, potentially paying them 100% through fundraisers. Students must also make a one-time purchase of several parts of their uniform. Our members are required to purchase their band pants ($50), gold regimental helmet ($65), ostrich plume for helmet ($25), band embroidered shirt ($30), and black band shoes ($25) totaling $195. There are other expenses that can be incurred but they are optional activities such as the Band Trip in the Spring. Indoor percussion ensemble and WInterguard also have extra fair share associated with them for the Spring semester. More information will be provided concerning fees during at the PARENT MEETING on MONDAY, JUNE 4th AT 6:30 pm in the MHS Band room (refreshments will be provided). Please download the info packet at the top for even more info. Thursday, May 21st - 6 p.m. - 8:30 p.m.
Thursday, May 30th - 6 p.m. - 8:30 p.m.
Each spring, prospective members are invited to the Band Hall for two rehearsals. These rehearsals are meant to give the new members an opportunity to experience what it is like to be a member of our band by playing, marching and having fun along side veteran members. We also issue all members lockers and school-owned instruments as needed. All students are encouraged attend both sessions. Even if you are uncertain about your musical future, we hope you give us a try. We are sure you'll love the Mighty Black & Gold. Wind student auditions will be held on two days in June during Rookie Camp. 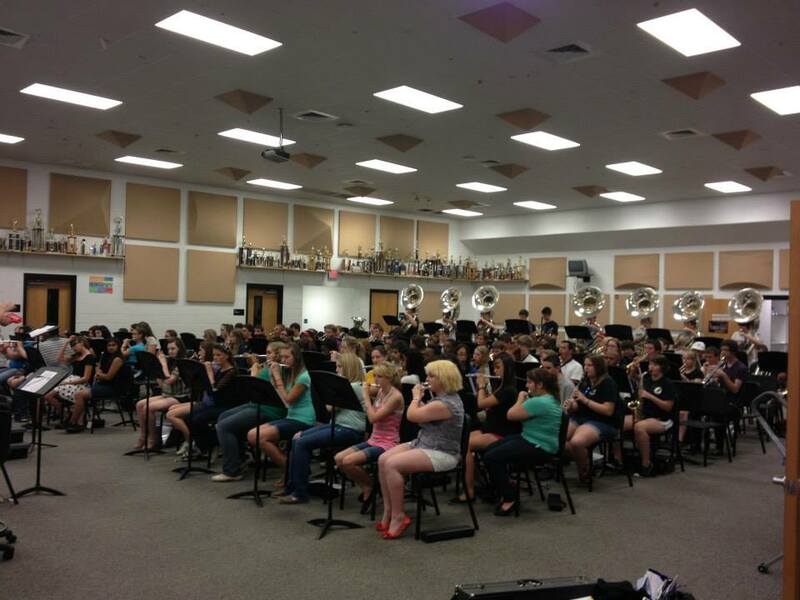 See the MHS Band audition page by clicking HERE. June 3-6 from 8:00 am until 3:00 pm. Rookie Camp is the required camp for all new members of our marching band program. The purpose of this camp is to teach our new members how to corps-style march, introduce them to the policies & procedures of our band program, and to work on the halftime show and stand music for football season. Auditions and uniform fittings are also held during the camp. If a member is unable to attend, they will likely be placed on the alternate line (see info on button above). 6:00 pm-8:30 pm in the MHS gym. Candidates are asked to attend all clinics. Do you like to dance? Strive for excellence? Like to stay physically fit? Perform in front of an audience? Make instant friendships that last a lifetime? Want to leave your mark while at Milton High School? We are looking for dedicated, athletic individuals with a positive, winning attitude, and that take pride in all they do. Please visit our audition clinics, no experience necessary! The Color Guard represents Milton High School by marching in parades, competitions, festivals and the halftime show at MHS football games with the Mighty Black and Gold Band. We also have guard game nights, a band lock-in, Christmas party, band banquet and a spring trip with the band. The guard also performs after football season has ended. They compete January through April in the Gulf Coast Color Guard and Percussion Circuit (www.gcgpc.org) and Winter Guard International. (www.wgi.org) Color Guard members also take the color guard class throughout the school year. Like our Facebook page at http://www.facebook.com/miltonhscolorguard. Follow us on Instagram at miltonhighschoolcolorguard. You can also check out our YouTube channel at http://www.youtube.com/user/MHSColorguardFL. Have questions? Please send them to the Color Guard Director, Ms. Samantha Byrd at sbyrd99468@gmail.com. Here’s your opportunity to get a head start on learning what you need to know to be successful. We will be offering rehearsals to returning members, and incoming rookies. Whether you’re wanting to be a part of the battery, (snare, tenors, bass drum, & cymbals), or the front ensemble, (bells, xylophone, vibraphone, marimba, and auxiliary percussion), we will cover everything you need to know to get a good start. ​Our goal is to get you ready for the upcoming drum camps which begin June 4th. Battery rehearsals will cover technique, (which applies to snare, tenor, and bass drums….it’s all the same), marching, learning how to play with a percussion ensemble, listening skills, rudiments, and moving your feet in time with your hands. Front ensemble rehearsals will cover technique, (it’s different than hitting a drum), scales, two mallet, and four mallet playing, listening skills, and playing with a percussion ensemble. Although it is not required, I highly encourage all returning members, and incoming rookies to attend these rehearsals.